Episode Review: LEVERAGE, "The (Very) Big Bird Job"
Apparently, the Season 5 premiere of Leverage crept up on me, but I did check out "The (Very) Big Bird Job" and had mixed feelings about it. On one hand, it was nice to have the Leverage Crew back. On the other, this episode felt very formulaic and outlandish all at the same time. The Crew's back from their summer vacations and reconvened in Portland, OR. Nate, Sophie and Eliot were surprised to find out that Hardison and Parker have set up a new HQ now that Nate's old apartment's under surveillance. He even got them their first case, a widow of a cargo pilot who died in a plane crash. As it turned out, the owner of the company (played by Cary Elwes) cut costs, and the pilot had proof of his shady business dealings. Scott Roemer, the mark, was a huge fan of planes and of Howard Hughes, so Nate decided to hook him by floating the idea of him buying the Spruce Goose (which is housed outside of Portland in McMinnville). The plot was further complicated when the Crew fooled Roemer into thinking that terrorists wanted the old plane because of its early stealth technology, which they could use to create undetectable nuclear bombers. All of the twists and turns made Roemer paranoid, and he even decided to flee on the Spruce Goose, which the Crew anticipated so they rigged a fake plane crash that tricked him into confessing his wrong doings and causing the pilot's death. Let me start off by pointing out what I enjoyed about this episode. Like I mentioned earlier, it was nice having the Crew back together, and I missed their chemistry and camaraderie. After four seasons, these five actors really work well with one another, and it's clear that they really enjoy being on Leverage and their rapport is infectious. 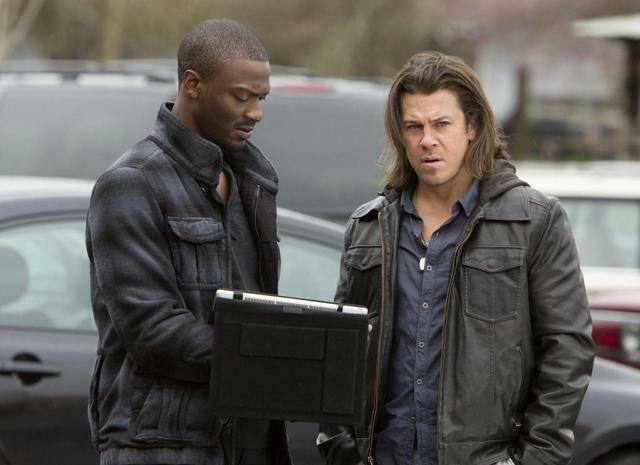 By far the best example of this bond was Hardison and Eliot, and watching them bicker about the menu for their new pub was Leverage at its best. I'm also happy that Portland gets to be Portland instead of Boston, even if the change was responsible for cheap jokes about the city. Let's hope it gets to be a character on the show like it is on Grimm. Now, on to the not so good stuff. Out of all of the jobs that this crew has pulled, tricking Westley into stealing the Spruce Goose was by far the contrived con they've ever tried. It was hard to believe that anyone would fall for Nate's tricks, and the episode just felt silly when it was all said and done. Now, I never expect Leverage to be believable, and I'll fully admit that its light, playful tone is part of its charm, but it didn't work for me this time around. I knew that Adam Baldwin was going to show up this season, but I hope he's not restricted to a brief cameo. Fingers crossed for his return down the line. I'm glad that the show introduced the Pardison romance so matter-of-factly and didn't turn it into a big deal, although I'm not too stoked that things are already shaky. Eliot freaking out about the pub's menu will always make me laugh. The only thing better than Eliot the Chef is Eliot's soft spot for kids. There's more there than we know, and I can't wait to find out what it is. High maintenance Sophie's my least favorite flavor of the character, so listening to her complain about PDX got old fast. While I didn't love everything about this episode, I was very intrigued by that final scene between Nate and Hardison since it's setting up the big mystery of the season. What's Nate up to now? As much as I love Leverage, it's hard for a procedural to maintain its freshness, and "The (Very) Big Bird Job" was an example of what happens when things become too formulaic. We get very familiar beats, and the show's attempts to shake things up fall flat and don't quite work. I'm not saying that Leverage is past its prime, but it does need to tweaked instead of things just getting bigger and more out there. I have faith that it can re-invent itself while keeping what makes it work so well, and I'll be sticking around for the long haul.